Most approaches to crime analysis focus on geographical crime mapping, which is helpful in identifying crime clusters and allocating police resources, but does not explain why a particular crime took place. 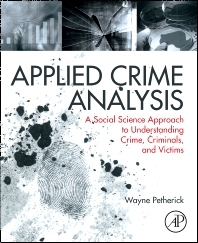 Applied Crime Analysis presents a model that brings statistical anchoring, behavioral psychopathology, and victimology from the social sciences together with physical and crime scene evidence to provide a complete picture of crime. This hands-on guide takes theoretical principles and demonstrates how they can be put into practice using real case examples. In addition to covering key topics such as staged crime scenes, false reports, and criminal motivations, the book’s includes a final chapter on report writing, showing readers how to use their findings to successfully advance to prosecution and succeed in court. 3.3. What is a crime scene? 3.5. What is physical evidence? 3.6. Should the crime analyst visit the crime scene? 6.1. What is case linkage? 9.1. What is risk assessment? 11.2. What is forensic psychopathology?